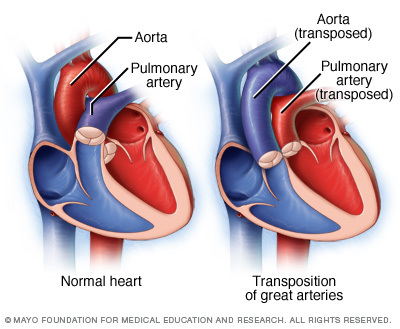 Transposition of the great vessels (TGV) refers to the switched positions of the aorta and the pulmonary artery. In this condition the aorta arises form the right ventricle while the pulmonary artery arises from the left ventricle. Abnormal rotation of the great vessels during cardiac development is responsible for this condition. Oxygenated blood from the lungs is pumped directly back to the lungs through the pulmonary artery (and is never delivered to other areas of the body). The end result of this is that oxygenated blood never reaches the tissues of the body, causing cyanosis. Chest X-Ray can reveal a “egg on a string” heart (marked by a narrow mediastinum). This is the most common congenital cyanotic heart disease in the neonatal period.